Look out! Meet Sammo the Stygimoloch! He’s excitable, fast and loves to ram into things! Switching between a dinosaur and a fast powerful car is easy to do in a few simple steps, making this 2-in-1 toy hard to put down! Press the talk button to hear fun phrases and to learn dinosaur facts, then tap the sound button or move the dino to hear great dinosaur and car sound effects. Converting between the two different modes helps your child develop motor skills and the exciting sounds and facts help to promote imaginative and independent play. Just Switch & Go! Within a few steps, you can easily change your vehicle into a lively dinosaur! 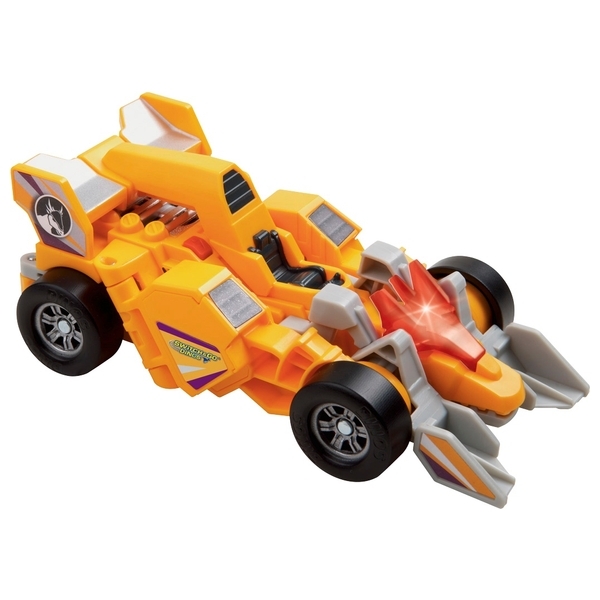 Plays sound effects as you push along and when transforming. Press action buttons to activate dinosaur facts and sound effects. Educational flash card included.